Make up to 5 Phone Carrier Lookup requests. Have a question about Phone Carrier Lookup results? Check out Phone Carrier Lookup documentation here. Looking for an API or batch Carrier Lookup service? RealPhoneValidation offers Phone Carrier Lookup a fast, affordable solution. Start a trial now and receive 100 validations. Phone Carrier Lookup allows you to determine the cell carrier of mobile phone numbers, but that’s not all. Our Phone Carrier Lookup service will also provide other helpful data about the quality of your contact information before you make contact with them, which when used properly will allow you to spend your time focusing on the best numbers. Use Phone Carrier Lookup to clean up and organize your lists by determining whether a phone number is a landline, cell, or VoIP. Then save time and money by reaching out via the proper channel. Providing the carrier shows that you are familiar with the recipient. This reduces the chance of your message being handled as unsolicited. Providing the phone carrier lookup information also helps text messaging servers. It allows them to determine most efficient delivery route for your message. Not all carriers are created equally. Identify carriers commonly associated with fraud and add additional check points. How Accurate is Phone Carrier Lookup? Our service provides the absolute latest information available. Carrier Lookup uses the exact same data the carriers use to identify mobile network from number and route traffic into and out of their system. Beware of phone carrier lookup services that only tell you the default carrier based on area code and exchange. Today phone numbers are moved from landlines to cell phones and from carrier to carrier on a regular basis. As a result if the data you are receiving is not real-time information you are out of date. Phone Carrier Lookup provides you with real-time data you can count on. If you don’t have an account yet start one here. For complete Carrier Lookup documentation see Carrier Lookup API or batch instructions. Files are processed as received. Depending on volume your file should be returned anywhere from 2 to 30 minutes. 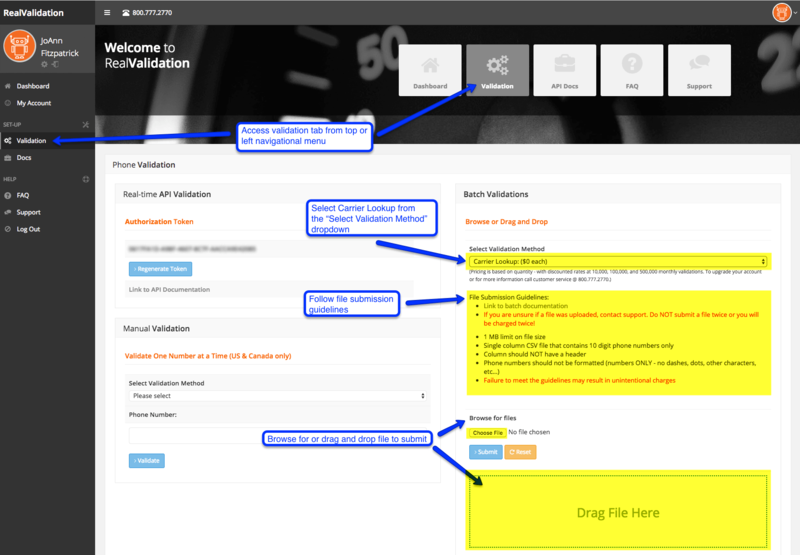 If you do not receive your file after 30 minutes please check your spam folder and whitelist Alert@RealValidation.com to ensure you receive files in the future. To check phone carrier create a RealValidation account and get access to our entire suite of phone data services sign up here. Still have questions? Give us a call at 800.777.2770 we are happy to talk to you about your specific use case. Find out if the number is connected or disconnected before you call. Sometimes you just need to know if it is a landline or mobile number. Know if a number is on the Do Not Call List before you make the call.